Specialty: Produces Electronics, semiconductor manufacturing equipment, industrial machinery, telecommunications equipment, power plants, information systems, automotive components, materials, construction equipment. 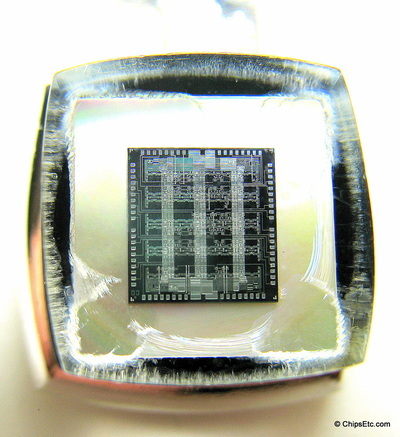 Developed hybrid LSI chips in the 1960's. Co-developed the z800 mainframe computer with IBM. 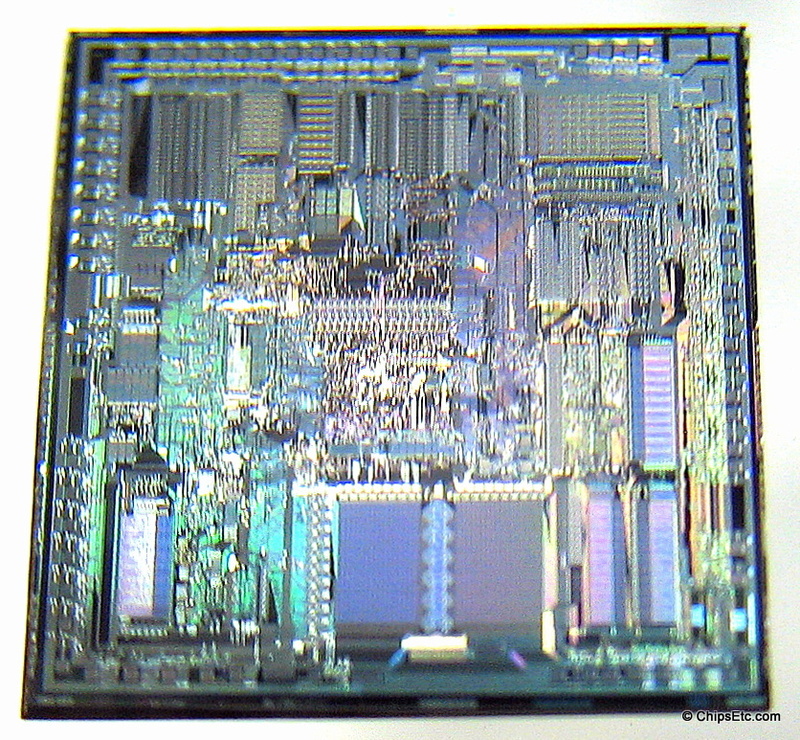 Developed the original 32-bit RISC processor SuperH family. 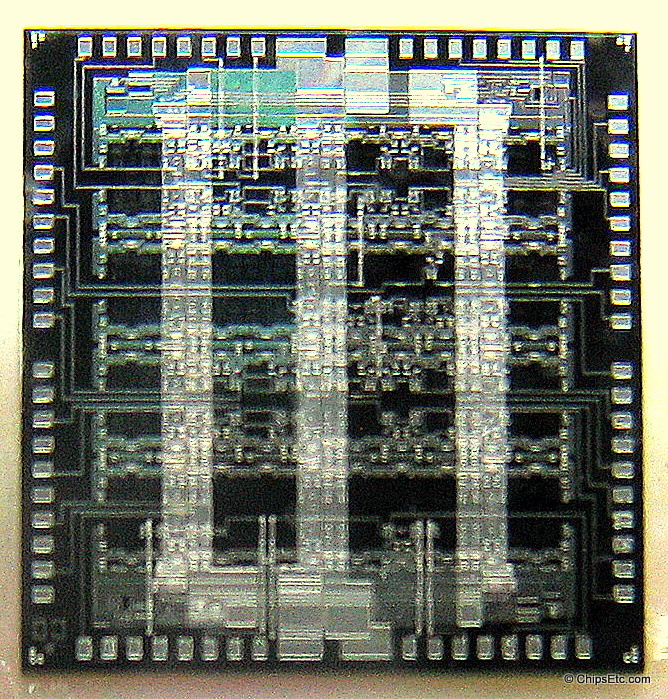 First successful prototype of 1-Gbit DRAM memory. This Tie Bar was a promotional gift by Hitachi that features a computer memory chip. 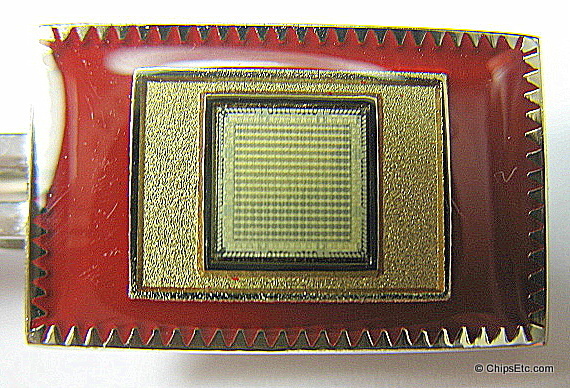 Silver-tone metal tie bar with red enamel background. 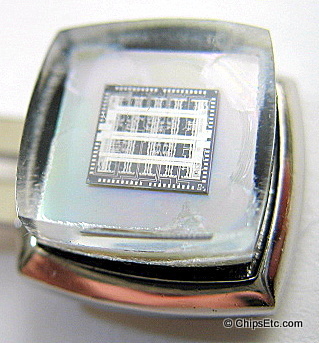 Another promotional Tie Bar by Hitachi that features an actual Integrated Circuit chip. 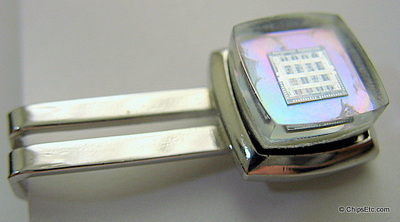 Silver marked tie bar with pearl background covered in acrylic. 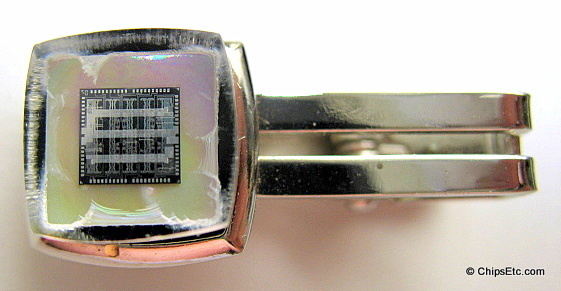 This Tie Bar was a promotional gift by Hitachi that features a "HM4864-T" 64K DRAM Memory chip. 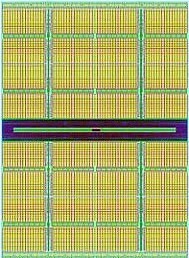 The Hitachi HM4684 DRAM was a 65,536-word x 1-bit MOS Memory Chip manufactured using Hitachi's double-poly N-channel Silicon Gate process. Gold-tone metal tie bar with yellow & brown framed enamel background, in original gift box. This Tie Bar was a promotional gift by Hitachi that features one of their "HM50256M" 256K DRAM Memory chips. 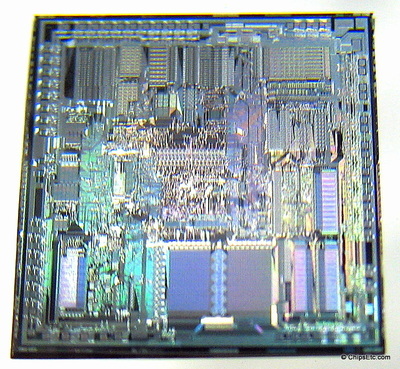 The Hitachi HM50256 was a 262,144-word x 1-bit DRAM manufactured using 2 µm CMOS process. Gold-tone metal tie bar with green enamel background, in original gift box. 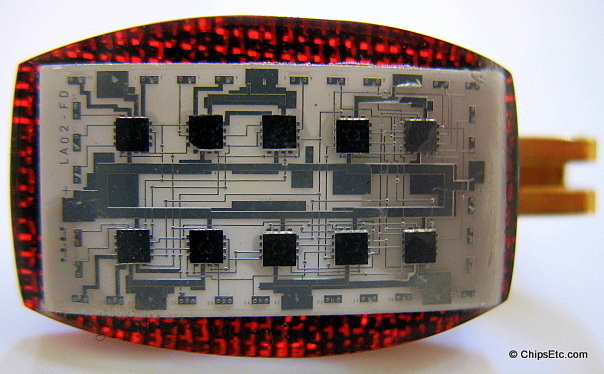 Tie bar from Hitachi features one of their thin film hybrid integrated circuits encased in Lucite. This hybrid chip has ten individual silicon chips mounted on a thin-film substrate. 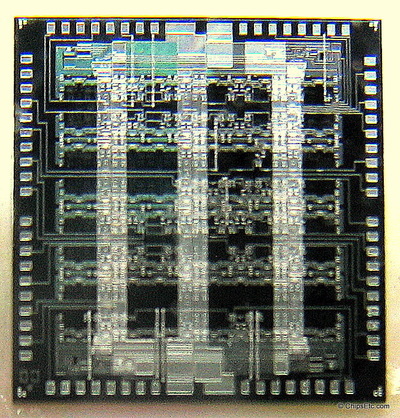 This multi-chip package is marked "LA02-FD". 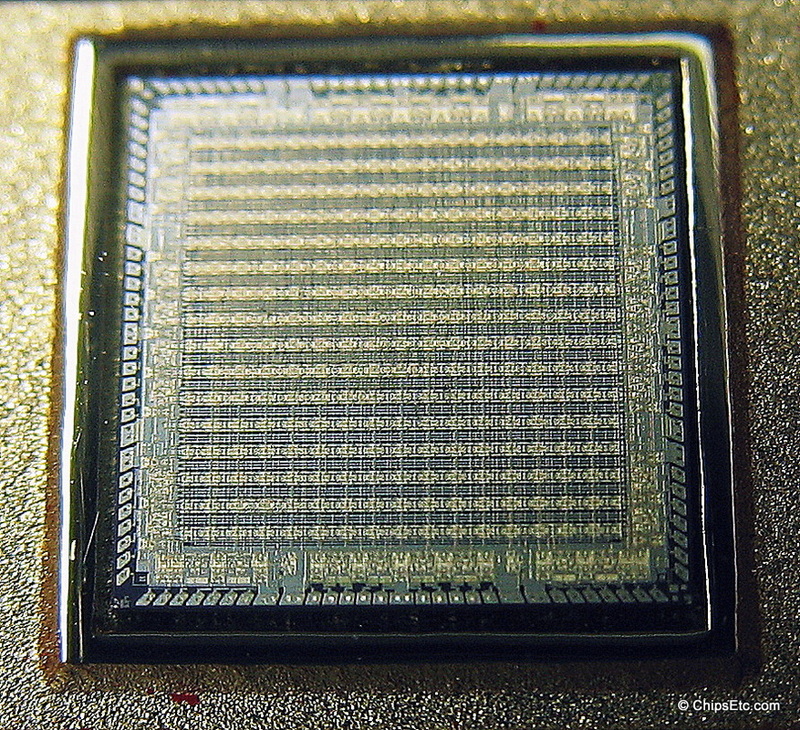 This Tie Bar from Canon features a Hitachi Microprocessor Chip and in the background is a Canon Wafer Stepper. 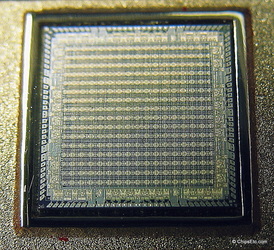 The Hitachi chip is marked "1984 LD7037 SSG II" when viewed under a microscope. Gold finish metal tie bar, does not have gift box. 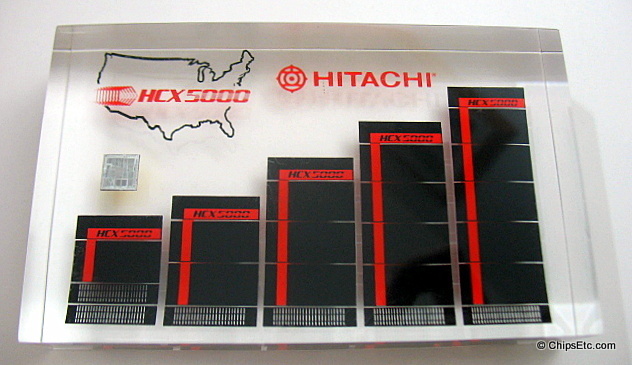 This Lucite paperweight from Hitachi features an Intel 80286 Microprocessor chip used in their HCX5000 PBX (private branch exchange) systems. 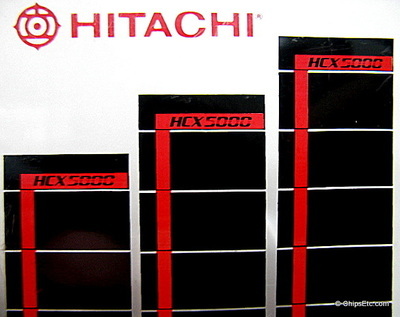 The ISDN capable HCX5000 series was introduced by Hitachi America's Telecommunications Division in 1989 as a PBX product family serving a broad range of customer application needs, from 100 lines to over 10,000 lines. A Hitachi PBX digital telephone system would have been used to manage the exchange of numerous internal and external phone calls taking place at a hotel, hospital, office, business, etc. ​Item measures 5 " wide x 3" high x 1" deep.